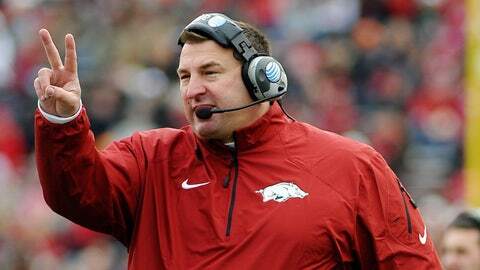 Does Bret Bielema want two slices or a two-point play? Arkansas takes on Tennessee on Saturday night in Knoxville. Both teams are looking for their first wins in conference play. A mass amount of preparation has surely taken place. And no doubt a lot of take-out food consumed. The Barley’s Taproom and Pizzeria Maryville had some fun with the Arkansas head man, offering up a "Go Vols" message made out of olives on top of the pie. Here’s the real question: Did Bielema partake in the delicious-looking pizza? It would seem like the polite thing to do.